Buy Outdoor Fireplaces, Camping Grills and Hi-Temperature Burn Barrels ranging in prices from $269.00 to $448.00! $20 Off Shipping on Any Incinerator Model. Enter Code 20SHIP During Checkout! 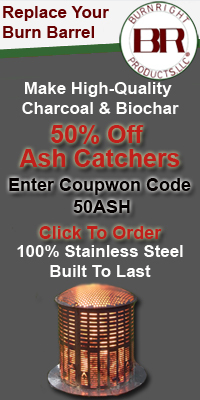 Save 50% on Ash Catchers. Enter Promo Code 50ASH at Checkout! 1. 100% stainless steel construction. 2. Easy cleaning, lightweight & portable. 3. Patented Air-Flow design enables temperatures to reach 1800°F. 4. Removable spark arrestor cover contains burning embers. 5. Safer & more environmentally friendly than traditional burn barrels & fire pits. 6. Help protect you from identity theft. 7. Permanently eliminate confidential & classified documents. Found a coupon for Burn Right Products?